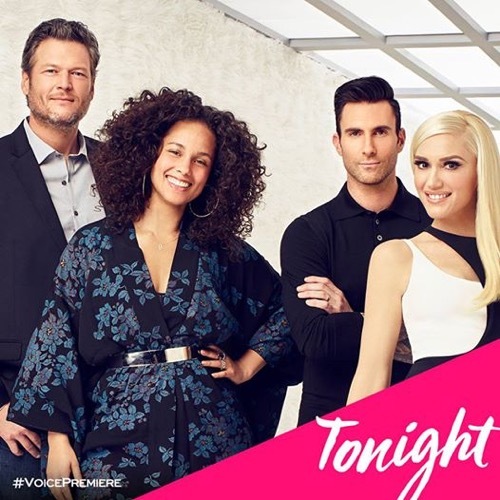 So make sure to bookmark this spot and come back for our The Voice recap between 8PM – 10PM ET! While you wait for the recap make sure to check out all our The Voice spoilers, news, videos, recaps & more, right here! Autumn Turner is an ice skating coach from New Jersey who starting singing in high school when she joined an all-girl group. They recorded some songs but they never really took off and she left her music behind. Her song choice is “Last Dance” by Donna Summer and by the end of the song all four judges turn their chairs around. Adam makes the argument that he will do ANYTHING to get her on his team. Gwen tells Autumn that she is in a place in her life that she could learn from her. She wants her on team Gwen. Blake says he is dying for Autumn but Adam interrupts him making his case for team Adam. Alicia also says she would love to have her on her team. All the coaches agree Autumn’s voice is not of this earth. Autumn picks Alicia. The other coaches can’t hide their disappointment. Blake takes time to make fun of Adam’s clothes and Adam tells him he may be sleeping on the couch if he does keep Gwen happy. Jesse Larson is from Minnesota and he plays a guitar that he made with his own two hands while he sings. He played in bands for almost 15 years before he got a call from Prince in 2015. Prince hired him to play guitar and sing back-up for Judith Hill who is a previous winner from the Voice. Unfortunately, the gig only lasted 4 months. His performance of “Jealousy Guy” by John Lennon causes Adam to turn around quickly. Adam is the only one to turn around and compares Jesse’s voice to the blues greats. Adam is thrilled to have Jesse on his team. Blake continues to insult Adam’s outfit. Aliyah Mulden is from California and is 15 years old. She has opened up from Jesse McCarty and played at the BET Awards. Her father died when she was just a month old but she thinks she got her musical talent from him. She would love to be on Alicia’s team. Blake turns around in his chair and thinks he is going to be the only one but Alicia and Gwen turn at the last minute. Blake plays up his past winners of two young girls. He thinks he can make her a winner also. Blake shows the most enthusiasm with the two female judges not have a lot to say and Aliyah picks Blake. She loved what he had to say about her future. Blake points out that he only has young women on his team so far. 16 year old Savannah Leighton from Alabama says music is her escape. He dad left when she was just 6 years old and her mom had to work three jobs to support their family. Her step dad has been the savior for her family which included two younger brothers. She sings “Unconditionally” and both Blake and Gwen turn around. Blake tells Savannah he can’t imagine how she is feeling. Gwen interrupts to say she can imagine how she feels since she is a girl. Gwen says she has so much more to offer than Blake. Savannah likes what she hears and choses Gwen. Girl Power will be their motto. Blake and Adam continue to trade insults. Nick Townsend is 23 years old and has sung all over the world. He is original from Nebraska and he sings “Writings On The Wall.” No one turns around and Adam tells him is just a little flat and that is why he didn’t turn around. Alicia says he had the technique but not the emotion. Nick says he won’t give up. Lilli Passero is 26 years old and is from California. She is a singer and actress who pays the bills by waiting tables. Her whole family is very musical and she has been singing since she was 6 years old. She sings “A Love Of My Own” by Carla Thomas. Three of the four judges turn around. Adam is the only one who didn’t turn. Lilli says she is inspired by Marvin Gaye and Aretha Franklin. Alicia says Lilli’s song was so cool and emotional. Lilli tells Gwen that she was her waitress before. Gwen says she loves Lilli’s vintage sound. Alicia sings to Lilli trying to get her to pick her as her coach and she is successful. Lilli believes Alicia will help her reach her dreams.